In some ways, the first hour of Sagaa might remind you of Vetri Maaran's Vada Chennai. And it is not only because Saran, who played Aishwarya Rajesh's brother in that film, plays the protagonist Sathya here. Set in a jail for juvenile children, director Murugesh actually shows us glimpses of what happens in such prisons, much like the Dhanush-starrer. You have the children fighting each other in a fight-club-like arrangement in the prison to stand out from the rest. You have gangs, gang leaders, and the well-oiled nexus between the top dogs of the prison and the officials. And to one-up Vada Chennai, the boys in the juvenile jail in Sagaa are shown improving their life skills by indulging in carpentry, automobile mechanic work, cooking, reading, etc... skills that will actually serve them well once they are released from the prison. But, due to certain twists in the tale, there comes the necessity for a jailbreak, and unfortunately, once the film shifts its focus and moves to happenings outside the jail, Sagaa becomes an incoherent mess. Apart from Saran, the principal actors are the boys from Pasanga — Sree Ram, Kishore, Pandi — and Prithvi Pandiarajan, who plays a negative role. Sagaa is essentially a cat-and-mouse game between the escaped convicts and the prison warden (Sai Dheena, who plays the role with meticulous intensity). Scenes of custodial violence are always disturbing, and Sai Dheena's menacing demeanour adds to this. In between all this, there is also a human trafficking angle, which, while it just adds to the confusion, does lead to one of the better scenes in the film, one which addresses the topic of stalking and women safety. Murugesh tells a tale of friendship, betrayal, revenge, and love through the eyes of these boys. The dialogues about their friendship and loyalty are heart-warming, and the performances are effective. He even manages to get the occasional laugh. And Niran Chander's cinematography elevates the film, especially in the innumerable chasing scenes and well-orchestrated action sequences. Sagaa's undoing, however, is its romance portions, mainly due to the lack of strong female characters. Aayira and Neeraja play the love interests, and while the former might have had a better role on paper, neither of them have really fleshed-out characters in the film. And in a film about crime and criminals, the most criminal thing is the god-awful placement of the songs. What makes it more infuriating is that the songs are preceded and succeeded by very intense scenes, heavily aided by Shabir's impressive background score. The Yaayum song is worth all the hype, but did it really have to be used every few minutes in the second hour? 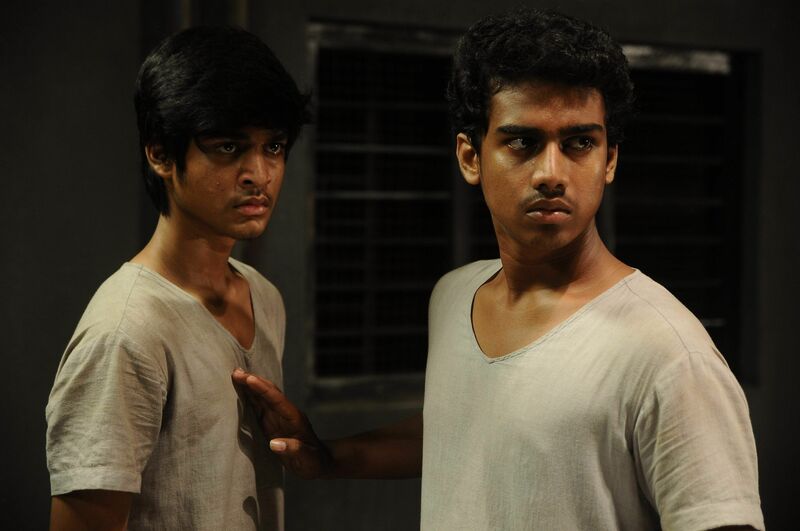 Right from the time Sagaa's trailer came out, there have been comparisons with Goli Soda (2014), another film that revolved around a group of young adolescent boys. What made Goli Soda work was the boys being treated as boys and not men. Murugesh's treatment of Sagaa as a proper commercial film is what has failed him. While it is impressive that he doesn't hold back any punches because his actors play boys, and not men, they are also burdened with pointless romantic numbers, sacrificial side-kicks, too many slow-motion shots, hollow punch dialogues, and inconsequential heroines. Don't we have enough heroes living these lives already?